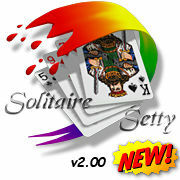 Solitaire Setty is a powerful cardset design tool for Solitaire City. It is completely FREE and you need to download it in order to convert the project files on this page into cardsets that can be used in Solitaire City. Complete overhaul with new look and user interface. Create new Jumbo and King Size cardsets for Windows. Create Pocket PC cardsets and upload them directly to your handheld. Change the colour and brightness of numbers and suit symbols. The following project files that were available for Solitaire Setty v1.03 have been modified to a higher definition so they look fully detailed in the new Jumbo and King Sizes. All project files on this page are incompatible with v1.03 and require Solitaire Setty v2.00. Vegard Krog Petersen appears to have a little crush on Sarah Michelle Gellar (AKA Buffer the Vampire Slayer) 'cos he's created all sorts of Buffy cardsets, including a couple for Solitaire City ..... and why not ? She's hot ! Scarlett has gone all out and created decks for each of the four Star Wars movies. Just ignore her references to a certain wooden solitaire game. You'll find other decks here too. Roy Archer has turned his favourite British postage stamps into cardsets. Click Here if you need help converting these project files into Solitaire City cardsets. If you'd like your website featured here then make sure you create a nice web page where people can download either Solitaire City cardsets or Solitaire Setty project files and then send me the link. Please don't e-mail me cardsets hoping I'll feature them on my website. I only link to other people's pages here.